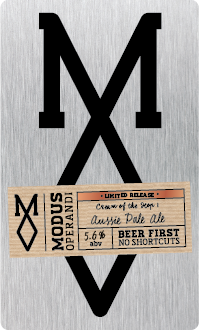 Modus Operandi have garnered themselves quite the reputation when it comes to hoppy beers. Thus far that’s largely been thanks to brewer DJ McCready who, having brought his experience working in the comparatively advanced US beer scene, has been creating recipes that manage to balance in-your-face American flavour and flair like a stilt walking, stars and stripes adorned Abe Lincoln mascot. But the brewery’s latest one-off is something of a departure from the norm, not because they’ve shied away from hops (as if that would ever happen), but because it’s their first beer using only Australian hops. Cream of the Hop #1 is the first of what will be an annual brew showcasing a locally grown experimental hop variety. The same base beer – a wheat pale ale – will be used from season to season, but the hop will change. The 2015 vintage features the suitably nondescript HPA-35, of which little is known unless you happen to be one of those that grow it or have been offered the chance to brew with it. If the idea of a new Aussie hop has you thinking of the kinds of punchy tropical fruit characters which have made Galaxy a star of the hop world, on the evidence of this, HPA-35 doesn’t seem to be following that sort of path. This one’s a little earthier and not so immediately light and breezy. That said, it’s hardly aggressive as the bitterness keeps a low profile while the floral and fragrant characters of the new hops (with a little cameo from Cascade) slowly wander from the back of the stage and into the spotlight. They may not have brewed HPA-35 before but Cream of the Hop #1 has been brewed well: if all you were after was a clean but flavour-filled pale ale, this would do the job with a bit to spare. But if you’re in the mood to properly ponder the hop profile, there’s plenty to keep teasing your tastebuds.